The results I am getting don't seem to match my search. What am I doing wrong? I don't understand the difference between the options "Save Document", "Save Page", and"Download PDF". How do I download the original PDF of a document in the docFinder? How do I export documents that I find using the docFinder? I have a docFinder account, but my Email has changed. What do I do? The "Remember Me" box is checked, but I keep getting signed out. What is wrong? How do I sign up for PLS docFinder? I forgot my password or my username; how can I get them back? I am not able to Log In... What do I do? Are there volume licensing options available for my company? I see documents that are tagged improperly. Is there anything I can do? Is there a way I can add my own content to the PLS docFinder Database? What kind of content does PLS index in the PLS docFinder Database? My friend uses a different browser than me, and docFinder seems quicker. Is there a specific browser I should be using? General Information to other things that may be helpful. The number of possible results when tags are combined is display by the tag names. The docFinder’s landing page is its Main Search Page. The user can utilize every tool they need to build the exact query for relevant results. Each slide or page in the database is marked by a number of tags which indicate if a certain type of data is present on the corresponding slide. These tags have been chosen by PLS as markers that are important specifically for the Oil & Gas Industry. They are useful for narrowing down the results of one's search significantly, to get precisely the data one is looking for. For example, if one is looking for the average finding costs in the Marcellus, one could make a text-based search for "marcellus" including only slides flagged as finding costs. The data flags are organized into categories so you can intuitively narrow your search down. The number of results that your search will yield is updated as you select additional filter flags in a counter located beneath the keyword search box. The number of possible cross-results is displayed next to the corresponding flags. After selecting your desired filters, you can also narrow the query by presenting companies and the date of presentation. This company field will fill automatically and the selection of multiple names is possible by hitting the Tab key. Lastly, the Main Search Page contains a standard search box, in which the user can quickly enter in a search term or phrase (see Text-Based Search Terms & Syntax for more information) and view the corresponding results from any filters and keywords they use. The number of results for the combination of keywords and filters will update dynamically beneath this box. Once all of the desired flags have been selected and the custom query is ready, users can go to the results overview page with "Search & Seek" or jump straight into the docFinder viewer by selecting "straight to viewer". Sort results by date Documents can be sorted by date in the results page by clicking on the column header. View results by page, rather than by document Users can change the view of the results page by clicking on the tabs on the top left of the results grid. Once the search is executed, the results screen will appear. From this screen, the search can be further narrowed down, results can be viewed and exported, and the user can jump into the viewer (see Using the Viewer Page below). To sort the results by column, simply click on its header text. To narrow the search down further, you can use the drop down boxes on the left and select additional filters. These are the same as the main search page. Any filters you have selected will appear in bold under their respective category name and can be removed by clicking on the "X" to their right. One can add more keywords using the search box at the top and selecting "Search". This will limit the new keyword to the present results. New search will create a new query and discard all of your current filters. On this results page there are two different views which can be alternated by selecting either of the tabs at the top of the results window. The default view is "View by Document", grouping together slides from the same document into a single row. Clicking on the row or the "Key Slides" link, will toggle the display of all of the key slides in the results for a given row. When shown, hovering the mouse over the number of a Key Slide will create a thumbnail preview of it. Similarly, hovering over the presentation title thumbnail will create a thumbnail of the title slide. 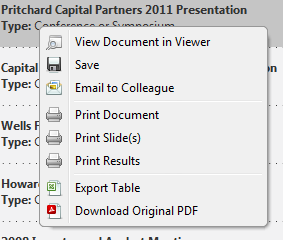 Clicking on either of these will open up the Presentation Viewer. The "View by Slide" view is similar to "View by Document", except that each row corresponds to a specific slide, rather than entire documents. As a result, there is an additional column indicating the slide's page number. This view may be preferred for smaller result sets, but may be a bit too cumbersome for larger result sets. In both views, clicking on the company name of the document will take the user to the company's profile page, where the user is able to see all of the documents in the docFinder database released by that company, in addition to some company history and related news from PLS's news arm. Find Key Slides The Key Slides which matched your search will be displayed on the bottom of the row of the document. Hovering over the page number will reveal a preview of the page, and clicking on it will view that page in the document viewer. Apply filters to your search In the results page, the dropdown filters on the left hand side of the page can be used to narrow down your results. Once the user is satisfied with the search they have created and the resulting documents, they can enter the document viewer by simply clicking on the key slide number in the "View by Document" tab or by clicking directly on any slide thumbnail in "View by page". Additionally, one can get to the viewer by selecting "Straight to Viewer" on the main search page. 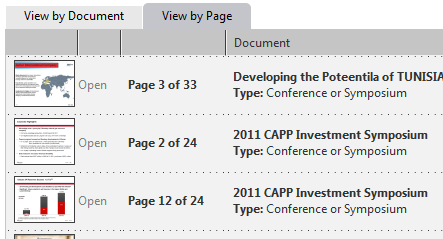 Viewer Page Tools Use the menu in the top right corner of the document viewer (also found by right clicking or going to the "cog wheel" menu. The docFinder’s Viewer is simple to use and designed to not detract from the information at hand. At the top you can alternate between the Key Slides your search returned and the document which contains your current slide. To zoom in to a slide in order to read small lettering, double click anywhere on the slide or click the magnifying glass icon at the bottom center. The left side of the window is the navigation pane. It contains the previews of neighboring slides and a set of six buttons which are used to move through the results set or document you are browsing. The single arrows move to the previous and next slides. The arrows with keys only work when you are viewing a document; they serve to go to the previous or next Key Slide, regardless of what is in the presentation between them. The buttons with double arrows take you to the first slide or the final slide in the set of 200 slides in the results. We limit the slides per column to 200- once you reach the end of a column of over 200 results, there will be a link to move to slides 201-400. This repeats every 200 results. You can use a mouse scroll wheel to move quickly through the slide column in the viewer. Results page context menu Right click on a row of the results grid to reveal several tools. There are various options concerning what you can do with a slide or document which you find useful. One can access these options from the results page by right clicking on the desired result’s row. Likewise, while viewing an individual slide in the Viewer, clicking on the top left cog wheel or right-clicking on the slide will call up the export menu. View Document in Viewer View the chosen slide in the document viewer. Save Saves the selected presentation to the user’s My Account storage. Export Table Parse and download the results grid to the user’s machine in Microsoft Excel format. Download Original PDF Downloads the entire selected document to to the user’s machine in PDF file format. Printing Results and Exporting to Excel can also be done by clicking the small icons in the top right of the results table. To save a search, click on the Save icon which looks like a diskette and it will take you to the Save Search management page. See My Account for more details. Document Viewer "cog wheel" menu Perform several actions to the current document or slide by using the menus available in the document viewer. Save Document Stores the entire presentation containing the selected Key Slide to the user’s My Account. Save Page Saves only the current slide to the user’s My Account. Save Search Save the search criteria to the My Account saved searches for future use or email subscription. Slide Image Downloads the current slide as a PNG image file. Document PDF Downloads the entire selected document which contains the selected slide to to the user’s machine in PDF file format. Slide to PDF Downloads the current slide to PDF file format. Search to PDF Save your entire search results to PDF for download (limited to 50 slides). Print Document Prints the entire document containing the current slide. Depending on your current location within the docFinder and current document or slide, selecting “E-mail to Colleague” will bring up a new window that will help you share your findings via E-mail sent from within the docFinder without necessitating an external mail client. Transaction Details Acquisitions & Divestitures Indicates that the corresponding Slide/Page contains data regarding a purchase or acquisition of Oil & Gas Assets. Field or Formations Portfolio & Operations Indicates that the corresponding Slide/Page discusses a Field of Formation. Reserves Portfolio & Operations Indicates that the corresponding Slide/Page contains reserves. Production Rates Portfolio & Operations Indicates that the corresponding Slide/Page contains production rates. Cumulative Production Portfolio & Operations Indicates that the corresponding Slide/Page contains cumulative production numbers. Production Analysis Portfolio & Operations Indicates that the corresponding Slide/Page contains production analysis. Initial Production Rates Portfolio & Operations Indicates that the corresponding Slide/Page contains Initial production rates. Rig Count Portfolio & Operations Indicates that the corresponding Slide/Page has a Rig Count. Key Wells & Discoveries Prospects & Geology Indicates that the corresponding Slide/Page discusses the discovery of Key Wells or Fields. Science & Technology Prospects & Geology Indicates that the corresponding Slide/Page contains information regarding Science or Conclusions. Well Log(s) Prospects & Geology Indicates that the corresponding Slide/Page contains a Well Log. Cross Section / Stratigraphy Prospects & Geology Indicates that the corresponding Slide/Page contains a Cross Section. Reservoir Characteristics Prospects & Geology Indicates that the corresponding Slide/Page contains characteristics of a reservoir or formation. Core Sample(s) Prospects & Geology Indicates that the corresponding Slide/Page contains a core sample. Seismic Images Prospects & Geology Indicates that the corresponding Slide/Page contains a 2D or 3D Seismic Image Profile. Completion Details Prospects & Geology Indicates that the corresponding Slide/Page contains completion details. Acreage & Land Land & Legal Indicates that the corresponding Slide/Page discusses Acreage or Land. Partnerships & Agreements Land & Legal Indicates that the corresponding Slide/Page contains references to Agreements, Letter of Intents, Litigation, etc. Well Spacing & Laterals Land & Legal Indicates that the corresponding Slide/Page discusses Well Spacing, Lateral Length, etc. Financial Results Capital Markets Indicates that the corresponding Slide/Page contains Financial Results. This includes typical financial statistics such as Market Cap, EBITDA, Cash Flow, Debt, etc. Financial Predictions Capital Markets Indicates that the corresponding Slide/Page contains a Financial Prediction. Capital Expenditures Capital Markets Indicates that the corresponding Slide/Page discusses Capital Expenditures. F&D Costs / RRC Capital Markets Indicates that the corresponding Slide/Page discusses the costs associated with Finding and Developing. Stock Data Capital Markets Indicates that the corresponding Slide/Page contains stock prices. Rates of Return/IRR (%) Capital Markets Indicates that the corresponding Slide/Page discusses Rates of Return. Operating Costs (LOE) Capital Markets Indicates that the corresponding Slide/Page discusses Operating Costs or Expenses. Debt Capital Markets Indicates that the corresponding Slide/Page discusses Debt. Valuations / PV Capital Markets Indicates that the corresponding Slide/Page discusses Present Value, NAV, etc. Corporate Structure Capital Markets Indicates that the corresponding Slide/Page contains cumulative production numbers. Gas Gathering Midstream & Infrastructure Indicates that the corresponding Slide/Page discusses Gas Gathering. Crude Gathering Midstream & Infrastructure Indicates that the corresponding Slide/Page discusses Crude Gathering. Pipelines & Facilities Midstream & Infrastructure Indicates that the corresponding Slide/Page discusses pipelines. Equipment Midstream & Infrastructure Indicates that the corresponding Slide/Page discusses Equipment. 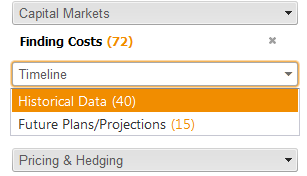 Hedging Positions Pricing & Hedging Indicates that the corresponding Slide/Page discusses Hedging, Derivatives, etc. Oil & Gas Prices Pricing & Hedging Indicates that the corresponding Slide/Page discusses Oil and Gas Prices. Summary & Highlights Page Classification Usually indicates that the corresponding Slide/Page contains summarizing information regarding previous slides/pages in the document. Peer Comparison Page Classification Indicates that the corresponding Slide/Page contains a comparison of two or more entities. Such entities can be companies, wells, reservoirs and formations, acquisitions, and more. Type Curve Data & Graphics Indicates that the corresponding Slide/Page contains a "Type Curve". This is usually a modeled decline rate for a well of a given area. Decline Curve Data & Graphics Indicates that the corresponding Slide/Page contains a Decline Curve. This can be for a specific well, several wells, entire company, etc. Well Bore Design Data & Graphics Indicates that the corresponding Slide/Page discusses novel Well Bore designs, or visually displays the design/patterning of Well Bores. Table Data & Graphics Indicates that the corresponding Slide/Page contains a table or tabular data. Bar Chart Data & Graphics Indicates that the corresponding Slide/Page contains a Bar Chart. Pie Chart Data & Graphics Indicates that the corresponding Slide/Page contains a Pie Chart. Operations Map Data & Graphics Indicates that the corresponding Slide/Page contains a Map showing the Operations of one or more entities. Plat / Leasehold Map Data & Graphics Indicates that the corresponding Slide/Page contains a Map indicating a Plat or Property Lines. Trend Map Data & Graphics Indicates that the corresponding Slide/Page contains a Map indicating a Trend. Isopach / Structure Map Data & Graphics Indicates that the corresponding Slide/Page contains a Map with an Isopach. Usually displaying geological information such as resorvoir depth, porosity, etc. Photo / Diagram Data & Graphics Indicates that the corresponding Slide/Page contains a Photo or Diagram. docFinder's syntax mimics the basic syntax of most major search engines. In most cases, you will simply type in a term into the search and see if what comes out is relevant. Some of the peculiar or more advanced usage is explained below. For explanations below, when you see a word styled such as these are, it is meant to indicate that that is the actual search query (ie, the actual text that you would type into the search box to get the same results). Typically, fewer terms will yield better results. If no operator is specified in a search, AND is the default operator (for example, the search bakken shale will translate into "bakken" AND "shale"). One can also use the AND operator explicitly if he/she so desires. You can specifically allow any of several words by using the OR operator. For example, the search "bakken" OR "three forks" will return any results which have either of the phrases "bakken" or "three forks" in them. You can specifically exclude any documents which contain a given phrase from the results. For example, the search marcellus -chesapeake translates to the search "marcellus" AND NOT "chesapeake"
docFinder indexes documents by several criteria. In addition to standard text-based indexing, similar to the technology utilized by internet search engines such as Google, Bing, and Yahoo, PLS docFinder treats each page of each document as its own entity. Each page/slide in the database is marked by a number of "Data Flags" which indicate if a certain type of data is present on the corresponding page/slide. These flags have been chosen by PLS to be markers that are important for the Oil & Gas Industry specifically, and are useful for narrowing down the results of one's search significantly, to get precisely the data one is looking for. For example, if one is looking for the average finding costs in the marcellus, one could make a text-based search for "marcellus" including only slides flagged as "Finding Costs". The docFinder’s My Account file system allows users to build their own database of relevant slides for quick recall and reference, as well as sharing their findings with others. 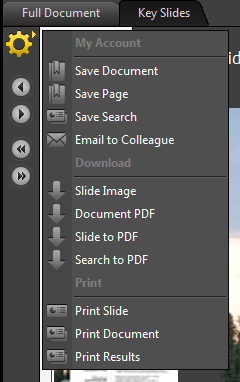 Users have the option to save slides or entire presentations in a custom folder hierarchy. They can invite colleagues to subscribe to folders, e-mail slides, and have shared group folders for multi-user projects. It is very easy to begin using the docFinder’s file system to customize your experience. Be sure you are logged in with your subscribed PLS user name and password. At the top of any docFinder screen you will see the My Account link; selecting this will take you to your storage home page. See Exporting and Downloading for instructions on finding the option to add the slides or presentation to your personal file system. Once you have selected Save, a pop-up menu will ask you where you would like to store the document or slide. You can create a new folder by selecting the small folder icon in the toolbar. Once you have selected the location, you must select a save name for the slide or presentation. Lastly, you have the option to include comments in the notes field for yourself or others who will be viewing the slide at a later time from your storage system. Once you are satisfied, select Save. The slide or document will now show up in your My Account home page folder structure. The My Account page enables users to share a slide, presentation or folder with co-workers or colleagues who also have PLS docFinder accounts. Users can share items that they have saved or created to their My Account storage quickly and easily. First, select the slide, document, or folder which you want others to be able to view or access. Then click on Share in the top toolbar or, alternatively, right click on the item and then select Share. The Sharing dialogue fields will appear. You can invite as many collaborators to the item as you need by entering their email addresses separated by commas or hitting enter; they need only have docFinder accounts and the proper rights which you will select at the bottom of the box. Note that all invitees on each message will have the selected Permissions level. However, these can be changed per individual user in the next screen. Please see “Modifying or Removing others' permissions for Items and Folders” for more details. Read only: Users will only be able to open, download, or print the item you are sharing. Read & Write: Users will the above Read rights as well as be able to add new folders within the shared, edit notes, and remove documents. When your invitees, message, and permission level are to your liking, hit Share. In order to modify or remove the permissions which you have granted to collaborators for a file or folder, you must be the creator or owner of that saved item record. Only creators or owners can only modify permissions for shared items. To see and edit collaborators and their rights, select the shared item (slide, presentation, or folder) you’d like to modify and then select Share in the toolbar above the My Account area. Users are also able to right click on the item and then select share out of the right click menu options. This will bring up the Sharing window. To edit the shared permissions, select “Edit Existing” at the bottom. You will have the list of all users who are able to see (Read Only) or edit (Read & Write) the item. The options to edit or remove the users’ permission will be on the right side of the corresponding user’s row. Notes are useful to remind yourself of what makes the slide important, when you found it, and so on. PLS’ docFinder has included a note system to add text to files and folders saved in your cloud file system. These notes and comments can be invaluable to your team in a shared folder or document. There are two ways to add a note to an file. The first is upon saving the file to your storage - see Saving Items to my Account. The second method takes place any time after that. When you are viewing the file and folders in your My Account page, select the notepad icon on the far right side of the desired item’s row. This will call forth the Notes/Comments box. Once you are done adding your text, hit Save and the note will be there for viewing and editing the next time you need it. Users can switch between Files and Searches by using the links on the upper right side of the My Account page. Saved searches can be useful if the areas or topics you are interested in rarely change. If this is the case, you can find the search that finds the content you are interested in, and then save it for future use. Once a search is saved, you can be alerted of new content which matches the corresponding search criteria in multiple ways. For example, if you are familiar with RSS Feeds, you can use your favorite RSS Reader to be alerted of new content. Subscribing to folders is a feature currently in development. See other features in development. Subscribing to docFinder is simple and easy. Anyone can subscribe online by going to the Subscribe Now page. Alternatively, visit the Learn more page to find out the results you can achieve with docFinder. Please visit the Login page, or click "Log In" at the top right of this page in order to log in to docFinder. 1. Do you have cookies enabled? Check and make sure that you haven’t inadvertently blocked PLS or the docFinder specifically, or added docFinder to your restricted sites list in Internet Explorer. 2. Are you using ad-removing software such as AdBlocker or WebWasher? This can sometimes cause downloads to fail by blocking cookies. 3. Are you viewing the site in Private mode (Firefox), InPrivate (IE) or Incognito (Chrome) mode? If so, cookies will not be persisted by design, and you must disable these modes in order for this functionality to work. 4. Do you have an anonymizing firewall or gateway? If so then that may be interfering with your login. 5. Clear your plsx.com cookies and cache to see if this fixes the issue. 6. Reset Internet Explorer’s security settings back to Default. We can't tell you your password, but we can help you reset it to something new. Visit the password reset page and enter your user name or the e-mail address we have on file at PLS. We'll then send you an e-mail that will help you reset your password. If you are unsure what your user name is, it will be the email address at which you receive this email. Sometimes password reset emails get misclassified and kicked to spam folders and other junk-mail traps. Please check your spam settings and try requesting another email. If this doesn’t work, you should contact PLS for further help. Please see "Submitting content to the docFinder Database". Please check your spam and junk e-mail folders. If you still cannot find the email, please Contact PLS in order to reset your account password manually. Please make sure that you are using the correct username (usually your email address) and password. If your login is failing repeatedly, please contact PLS regarding the issue. Corporate Accounts and Volume Licensing agreements are available upon request. Contact memberservice@plsx.com for details. Please note that it is most helpful if you provide specific details of the issue you are encountering, including screenshots, browser name and version, etc. Several new features are currently in development with docFinder. We are constantly trying to improve the user experience. docFinder is a large, dynamic tool which can provide a lot of information to a lot of people. However, the information will do no good and be wasted if we have misclassified or incorrectly tagged a slide. For this reason, we would like a small group of trusted “power users” that will have rights to view, edit, and add flags to the slides they feel can improve. In this way users can help us improve the quality of data for themselves and colleagues, making the docFinder more accurate and powerful each day. If you have questions, comments, or concerns not covered here on this page, please feel free to contact PLS directly.